Ask the Doctors – What can I do about toenail fungus? Dear Doctor: I had toenail fungus two years ago, and my doctor prescribed Lamisil. It took a long time, but it worked. Now the fungus, which is so ugly, is back again. Why is it so hard to get rid of, and are there any new treatments available? Dear Reader: Toenail fungus is fairly common, but that's not much consolation to the 6 million or so people in the United States who have to put up with it. It's an often-unsightly infection caused by a microscopic organism called a dermatophyte that lives beneath the toenail. More precisely, it colonizes the portion of the nail known as the matrix, which is underneath the cuticle. Initial symptoms are a yellowish or brownish discoloration of the toenail. As the infection progresses, nails will often become thickened, crumbly and malformed. Although the fungus affects the appearance of the nails, it actually lives on the layer directly beneath the toenail. That's why it's so difficult to treat. Your nails are made up of keratin, a tough, fibrous protein. The same hard shell that protects your toes is giving shelter to the fungus. For topical medications to be successful in killing the fungus, they have to be able to reach it. Anti-fungal creams and liquids are available, both in over-the-counter preparations and by prescription. But because nails are not porous, it's difficult for the medication to reach the infection in concentrations great enough to kill the fungus. As a result, success rates for topical treatments are low. Systemic medications, like the Lamisil your physician prescribed, take a more direct approach. You swallow the pill, it gets digested, and the medication enters your bloodstream. Your circulatory system delivers the medication directly to the fungus living beneath your toenail and, in the best-case scenario, kills it. However, there are drawbacks. Side effects can include headache, nausea and diarrhea. In rare cases, the drug can cause liver damage, so blood tests to monitor potential toxicity are needed. These infections are quite persistent, and your experience with recurrence is fairly typical. Although oral medications are the most effective, reported failure rates are as high as 20 to 30 percent. Nail growth is slow, which means treatment is a lengthy process. A big toenail can take anywhere from a year to 18 months for new growth to completely replace the old, infected nail. Oral treatment for toenail fungus generally lasts 12 weeks. Topical preparations must be applied for at least a year. Nail fungus is not a health risk to most people. But anyone with a compromised immune system, such as a diabetic who contracts nail fungus, is at risk of developing serious complications like foot ulcers. Therefore, it's vital that diabetics seek medical treatment. As for your question about new treatments, some physicians and podiatrists offer laser treatment of toenail fungus. Although some patients report good results, reliable data about the long-term efficacy of laser treatment is scarce. Our recommendation is that you meet with your primary care physician, who will want to do a physical exam of the affected area. Then you can discuss the specifics of the recurrence and evaluate which of the existing treatments are best for you at this time. 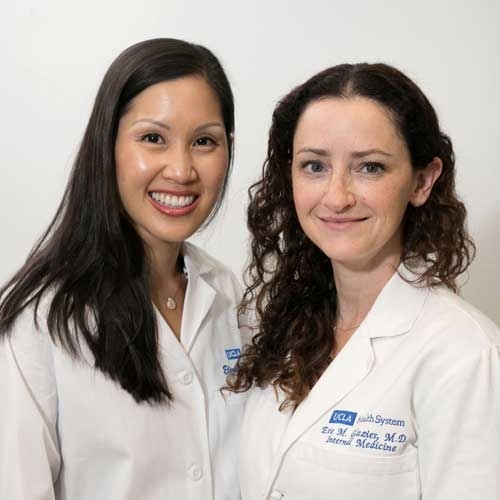 Eve Glazier, M.D., MBA, and Elizabeth Ko, MD., are internists and assistant professors of medicine at UCLA Health.